Bognor’s bosses have told their players to approach each of their final five games in the same manner that blew away Brighton’s youngsters. Tuesday night’s 5-1 hammering of Albion’s under-23s in the Sussex Senior Cup semi-final was in stark contrast to another home defeat last Saturday which left a low mood around Nyewood Lane. Manager Jack Pearce and coach Robbie Blake are not getting carried away by the result against a Seagulls team that included eight players from their under-18s – but recognise it was a big step forward after the 2-1 loss to Brightlingsea Regent that most think has ended their hopes of reaching the play-offs. Goals from Harvey Whyte, Brad Lethbridge, Leon Maloney and Jimmy Wild, plus an own goal by the keeper, secured the win over Brighton at Lancing which has set up a first Sussex Senior Cup final appearance in five years for the Rocks. 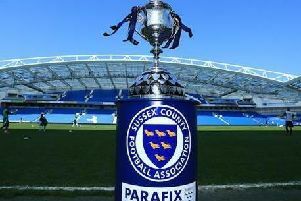 They’ll face Burgess Hill at the Amex on May 7. It lifted fans after Brightlingsea inflicted their eighth home league defeat of the season with a late winner – after Theo Widdrington had made it 1-1 from the spot – on a Nyewood Lane afternoon to forget in a hurry. Pearce said he would not go overboard about either result - but was delighted the club’s fans had a cup final to look forward to. “I try to keep things in perspective but I am frustrated for our supporters. Brightlingsea created very little and only really had the two chances they scored from,” Pearce said. “In the first half we weren’t good but in the second half we controlled the game and when we equalised, most people would have thought we’d go on to win it. But we missed two very good chances and then they scored a worldie. It was bitterly disappointing. “But on Tuesday night it was a great result and should be a great confidence booster ahead of the final few games. ~I know Brighton had a lot of their under-18s playing but we had a young side too. I was pleased with our application after what’s been a disappointing run. All components of the team worked well. “In the league I think we are about where we should be. I still say our league season ended when we lost Dan Smith and Jimmy Muitt in quick succession. No team at any level could lose two players who’d scored 46 goals and not suffer. Blake was forthright about the loss to Brightlingsea, saying it was simply not good enough and would not be tolerated. But he was delighted by the win at Brighton and said after the victory: “Not only were we really good in possession, we were good out of it as well. I told them to keep their discipline, keep their shape and we’d be fine, and I think it showed. “I’m pleased for the supporters because they’ve been disappointed with recent results. I think hopefully they’ve seen a glimpse of what we’re about. “We’re not out of the play-offs, even though people are saying we are. It’s stil mathematically possible and we’ve got to keep believing in that. Blake picked out skipper Whyte and young forward Maloney, on loan from Pompey, for special praise after Brighton were beaten. “Harvey Whyte is everything you need in a captain, he gives 150 per cent, he’s a credit to himself and a great asset to this football club. Blake added: “I’ve only been here six or seven months but I’ve already got a lot of affection for the club and the fans, I think Jack (Pearce) is different class and gets some undeserved stick. “If there’s a chance to get your hands on a trophy, you want to win it. The players, the staff, the fans, everybody’s pulled together, we needed a big result and we’ve produced it. Blake had words of encouragement for left-back Joe Tomlinson, who has spent the season on loan at Bognor but played against them for his parent club in the semi-final. Once again injury worries hit the Rocks’ team selection plans for the weekend, when they host bottom club Harlow. Doubtful after the Brighton win are centre half Keaton Wood (ankle), winger Walsh (hip), left-back Ashton Leigh (thigh) and striker Lethbridge (thigh). But Tomlinson, forward Reece Meekums and defender Ed Sanders are all available again after being cup-tied on Tuesday. Boss Pearce said: “Keaton is unlikely to play much between now and the end of the season. He is getting pain in the ankle he injured in September and we can’t risk him suffering a stress fracture.